You need real talent to succeed in the family hatchback sector these days, particularly if you want to make up ground on cars as good as Ford's Focus and Volkswagen's Golf. 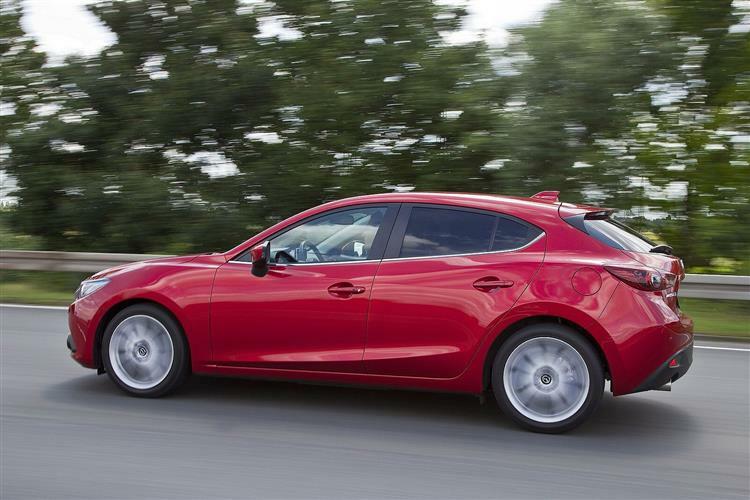 Does the fourth generation Mazda3 have exactly that? The signs are good: eye-catching looks, cutting-edge engines and one of the best cabins in the segment number amongst the highlights. 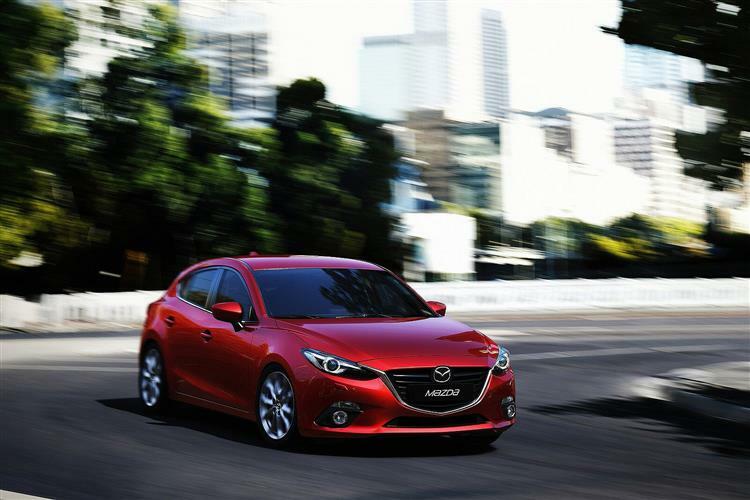 The Mazda3 is a car that has underachieved. The latest version looks set to comprehensively rectify that issue. Jonathan Crouch reports. The development engineer who led up the project to create this car, Kota Beppu, says the MK4 version of this Mazda3 will appeal to 'free spirits'. The sort of person perhaps who might want something stylish and interesting in this class but doesn't want quality or engineering compromises. Think of a car of this type as good to drive as a Ford Focus, as good inside as a Volkswagen Golf and as good to look at as an Alfa Romeo Giulietta. That's what Mazda was aiming at. So many other brands have started out in this sector with similar objectives but we can't help wondering whether this Mazda hasn't nailed them here. Mazda is offering a choice of three engines. Most sales will be based around either a 122PS 2.0-litre Skyactiv-G petrol unit (now a mild hybrid) or a conventional 1.8-litre 116ps Skyactiv-D diesel. The third option is the brand's more advanced Skyactiv-X Spark Controlled Compression Ignition engine, a 182PS supercharged unit which runs on petrol but uses a combination of spark ignition and compression ignition to deliver, Mazda claims, the driver appeal of a petrol unit along with the fuel efficiency and torque of a diesel. This Skyactiv-X powerplant is able to switch from compression ignition, which best suits day-to-day driving, to a form of spark ignition, generally when the engine is started from cold or the driver demands maximum power at high revs. The 'X' engine comes paired with four wheel drive for our market, but as you might expect, the cost of all this technology makes it a pricey choice. Most UK customers will choose the 2.0-litre Skyactiv-G variant, though the diesel is also worth a look. That Skyactiv-D black pump derivative makes 62mph from rest in 10.3s en route to 121mph. Mazda has put a great deal of effort in developing the sharp driving dynamics that characterised the previous generation model, though a relatively porky kerb weight - 1,350kgs even in the 1.8-litre petrol version, doesn't help here, nor does it really fit with the whole 'Skyactiv' 'less-is-more' ethos. The Japanese have finally realised that a car of this kind really has to visually stand out - or Mazda has anyway. 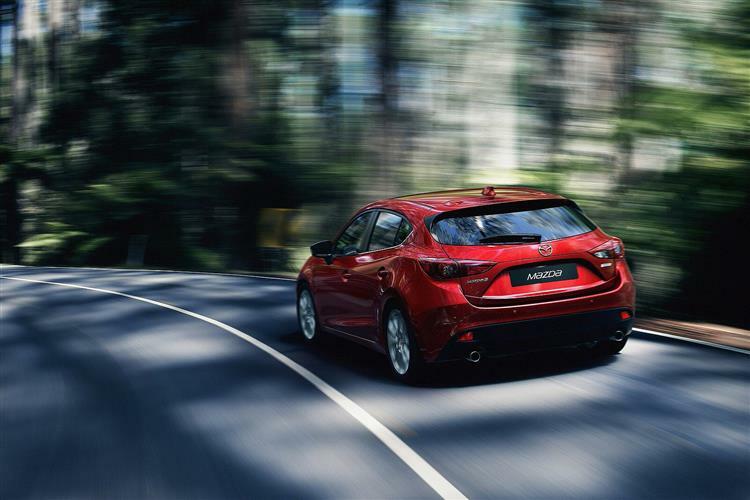 And sure enough, the hatch and saloon versions of this fourth generation Mazda3 will certainly make an impression in a car park full of Focuses, Astras and Golfs. The company's ridiculously-named 'Kodo' design language has been evolved into something really elegant here, with a low nose, elegant panel shaping and a sloping roof line that flows neatly into the rear screen. It's quite different from the angular styling of a comparable Ford or Volkswagen and could be almost said to have a 'premium' feel. The interior is even better. There are smart materials crafted with interesting design and button clutter has been well and truly banished. Does any car in the class have a better cabin that this? That's a bold statement but the Mazda designers have set an impressive standard here. It certainly makes the cabin of a Ford Focus feel pretty low-rent. One of the brand's problems in recent years has been the provision of rather small centre-dash screens but in this case, there's a big, clear 8.8-inch display on top of the dash nicely angled towards the driver. And there's a lower rotary controller for it so you don't have to stab away at inexact touchscreen functionality in the kind of way that's necessary with many rival set-ups. We're not quite so impressed by the level of interior space. There are much bigger rear seats in this class and the boot is smaller than before, offering just 295-litres of space - not much for a car in this class. From launch, pricing was pitched from just under £21,000 to around £28,000. You can talk to your dealer about either a five-door hatchback body style or a Saloon variant and there are five trim levels - 'SE-L', 'SE-L Lux', 'Sport Lux', 'GT Sport' and 'GT Sport Tech'. All are generously equipped, with features like a windscreen projecting colour head-up display with Traffic Sign Recognition, Mazda Radar Cruise Control and LED headlights. Every model in the line-up also features navigation, Apple CarPlay/Android Auto and an eight speaker audio system. From 'SE-L Lux' trim onwards, highlights include a reversing camera, smart keyless entry and heated front seats, while 'Sport Lux'-spec sees the cabin enhanced with additional chrome detailing, a frameless rear view mirror and rear privacy glass. 'GT Sport' trim sees the introduction of black leather seats with power adjustment, a heated steering wheel and a Bose audio set-up, while the range-topping 'GT Sport Tech' variants feature a suite of additional active safety equipment, including a 360o camera and Driver Attention Alert with an interior camera. 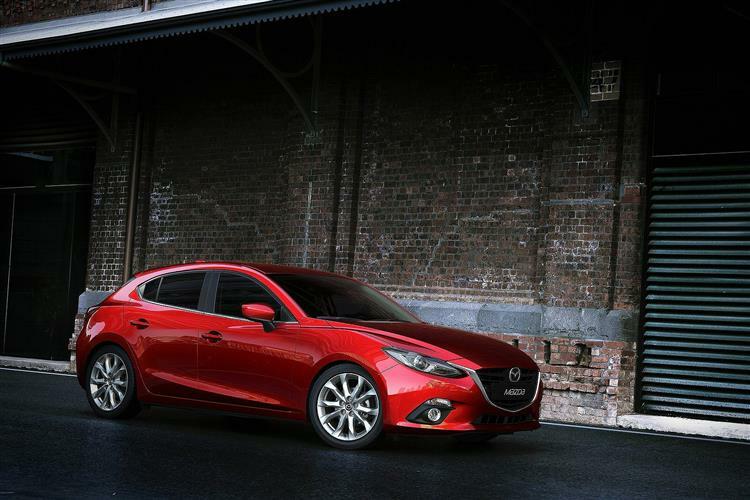 Offered exclusively on the hatchback, Mazda's newest paint colour 'Polymetal Grey' makes its debut with this car. 'SE-L' and SE-L Lux cars feature 16-inch silver wheels, while from 'Sport Lux' trim onwards, 18-inch Grey Metallic wheels, rear privacy glass and piano black window garnish distinguish higher grade models. The 1.8-litre Skyactiv-D diesel version, according the WLTP combined figures, manages 55.4mpg and 133g/km of CO2. The 2.0-litre Skyactiv-G petrol unit has cylinder deactivation which switches the car to a couple of cylinders under light-to-mid throttle loads. 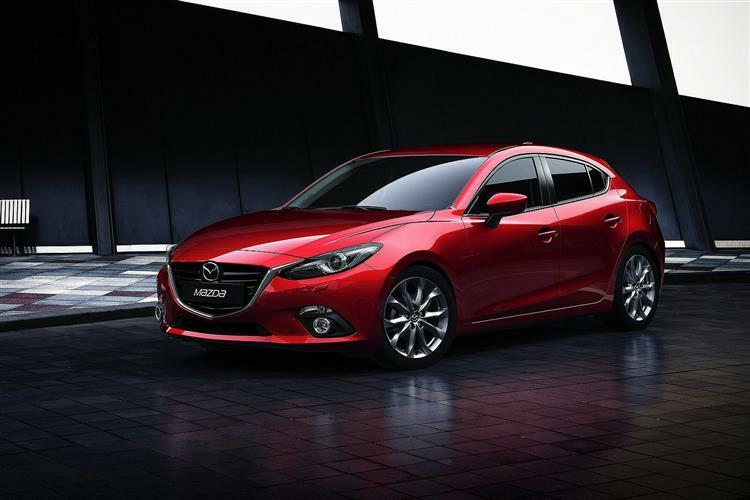 Plus the 2.0-litre Skyactiv-G variant incorporates Mazda's 'M Hybrid 24V' system. This mild-hybrid set-up improves fuel economy by recycling recovered kinetic energy. A belt-driven integrated starter generator (ISG) converts the energy in the 600kJ lithium-ion battery, while the DC-DC converter supplies it to the car's electrical equipment. As a result, this mainstream petrol unit manages 44.8mpg on the combined cycle and 119g/km of CO2. We should also mention the warranty, the usual unremarkable three year / 60,000 mile package. If you want to extend that, you can do so via optional 'Essential', 'Elite' and 'Complete' plans. Included in the standard package is a three year paintwork warranty and 12 years of anti-perforation cover. 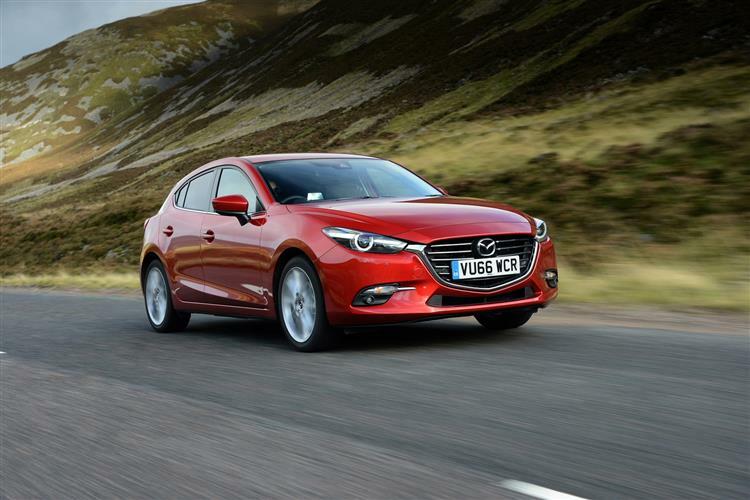 In addition, there's a 'Mazda Accident Aftercare' scheme which sees the company liaise with your insurer after an accident, making sure that you have access to a courtesy car if you need one and ensuring that all repairs are carried out to full Mazda standards. Mazda's been bold with this car and we can't help hoping that this strategy will pay off. This is a model that's never achieved the success it really ought to have had - but deserves to now. True, it may not be one of those family hatchbacks that grab you on first acquaintance, but the longer you spend with one, the more you appreciate the depth of thought that's clearly been put into the design of the things that matter; like the classy cabin, the and exemplary infotainment system and the hi-tech equipment. True, it's not the car you'd choose if family practicality was a priority. Aesthetics have clearly been prioritised here; that sloping roof does affect rear seat room and boot space. But the stylised lines that come with that swept-back silhouette will probably make you feel good about switching to a Mazda3. And that could matter more. * This is a stock offer and options shown have been pre-selected for this vehicle. Additional options cannot be added to this vehicle.